Last week’s 20th anniversary commemorations of the 1991 Soviet coup attempt prompted some personal reflections on other events affecting relations between Washington and Moscow during that turbulent period. Two years before the coup, a visit by U.S. warships to the Soviet Black Sea Fleet’s home port of Sevastopol made a significant contribution to thawing Cold War animosities. At that time, the Associated Press reported a “riotous welcome” from the citizens of that closed Crimean city, a characterization I can attest to as a U.S. Embassy officer witnessing the event. 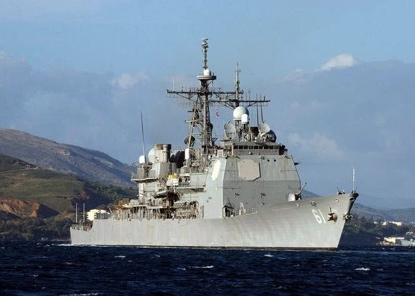 Recent U.S. “goodwill” forays into the Black Sea have encountered a much more mixed reception. A U.S.-Ukrainian naval exercise in June of this year was condemned by the Russian Foreign Ministry. In addition to Odessa, Ukraine, port calls included Batumi, Georgia, prompting Moscow to complain that Washington was encouraging Tbilisi’s “revanchist aspirations.” This negative reaction was probably more than merely a replay of the protests prompted by the 2008 visit of a U.S. Coast Guard cutter to Sevastopol following the Russia-Georgia conflict and aggravated by continued Russian-Ukrainian bickering over the status of Russia’s principal Black Sea naval base. This time, the U.S. Navy was represented by the USS Monterey (CG 61), a guided missile cruiser armed with SM-3 Block IA interceptors of the Aegis missile defense system (pictured above). The Pentagon had announced the Monterey’s dispatch from Norfolk with considerable fanfare, noting that it was the lead ship in the Phase 1 missile defense deployment under the European Phased Adaptive Approach (EPAA). Phases 1 and 2 of the EPAA have been consistently identified by the Obama Administration as a measured and appropriate response to the emerging threat posed by Tehran’s short- and medium-range missiles, whose reach extends up to 2,500 km beyond Iran’s borders. While Moscow never reacted to EPAA as vehemently it did to President Bush’s “Third Site” scheme for deploying strategic missile defense interceptors in Poland by 2015, neither was it completely sanguine. Indeed Moscow has never accepted Washington’s contention that the modest Iranian threat merited U.S. missile defense deployments in Europe and has long suspected such deployments were intended to undermine the effectiveness of Russia’s strategic deterrent. Specifically, Russian officials have continued to express worries about the mobility and quantitative growth potential of the Aegis cruiser platforms and the greater speed and discrimination of SM-3 Block II interceptors planned for EPAA Phases 3 and 4. The Obama Administration has worked hard to reduce Russian suspicions about missile defense through frank dialogue and persistent pursuit of missile defense cooperation, but Moscow continues to receive mixed messages and to harbor doubts. However disconcerting the words of Obama’s opponents may be to Moscow, the actions (and inactions) of his Administration are more telling. And it is clear that hoped for progress on U.S.-Russian cooperation in missile defense has not yet been made. Whatever other defense and foreign policy goals may have been achieved by the Monterey’s 2011 visit to the Black Sea, Russia’s anxieties about U.S. missile defenses have been aggravated by a close encounter of this kind. Likewise, U.S. testing of an SM-3 IA interceptor against an intermediate-range ballistic missile target in April 2011 – demonstrating a capability previously advertised as being available in 2018 when SM-3 IIA interceptors were deployed – only help to convince Moscow that its concerns are well founded. There are those who dismiss the sincerity and relevance of Russian concerns about U.S. missile defenses, or are content for the United States to pursue no further cuts in nuclear arsenals. However, for those who wish to see a follow-on agreement to the New Strategic Arms Reduction Treaty, further enhancing stability at lower levels of spending, it would be wise to weigh more carefully the net impact of U.S. missile defense activities on our indispensable negotiating partner. Russia has other options than arms control for ensuring that U.S. missile defenses do not pose a future threat. This entry was posted in Europe, Missile Defense, Nuclear Weapons, Regions, Russia and tagged Aegis Missile Defense System, Russia-Georgia Conflict, Russia-U.S., USS Monterey (CG-61). Bookmark the permalink. 1 Response to To Russia, With Love? Greg, great piece. It would be one thing if the system held the prospect of effectiveness against possible future Iranian ICBMs, but sadly it can easily be defeated by any adversary with the technical ability to make missiles. But advocates in the Russian military and government who argue for a response to the NATO missile defenses could play up the uncertainties about future missile defense developments by pointing to the many inflated claims made in documents like the BMDR and by senior U.S. government officials. (Cartwright once said he thought the system was 90% effective! ahem!) Over time, these internal constituencies may successfully pressure, or intimidate, their political leaderships to into actions that would have adverse consequences to U.S. security, as well as for the security of their own states. A similar dynamic also exists in the United States, where defense projects of dubious effectiveness, cost-effectiveness or need are often politically championed and eventually funded. Thus, even when missile defenses can be shown to have little, if any technical capabilities, they can still cause adversaries and competitors to react as if they might work. And we will have a full paper out soon. Clearly, the Russians and Chinese have a basis for real concern.